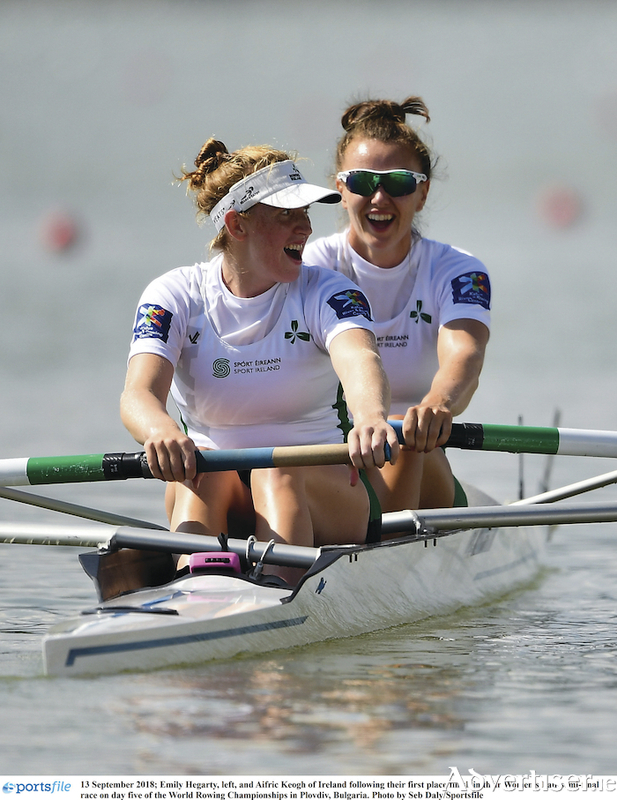 Two rowers made history when they became the first women's pair from Ireland to qualify for an A final, and in the hot seat were Galwegian Aifric Keogh and her partner Emily Hegarty from UCC. The history makers took the semi-final by surprise, particularly as they are a relatively new pairing this season. Although aiming for a top 10 finish, they raced an incredible semi-final, out-sprinting more illustrious teams, including Great Britain and Spain over the last 500m to take first place. Consigning Britain and the USA to the B final, the Irish women went out in the final against the big guns, and finished sixth in a time of 7:15.700, behind winners Canada, New Zealand, Spain, Italy, and China. It is a a huge boost for women's rowing in Ireland and particularly for Keogh (26 ), who began rowing at Coláiste Iognáid, winning national championships in crewed boats. Representing Ireland at the U23 World Championships in Linz Ottensheim in Austria in 2013, she finished fourth in the women's four, and was on the Ireland four at world championships in Amsterdam and Aiguebelette in 2014 and 2015. Watching this year from the river bank in Plodov in Bulgaria were Aifric's parents Jim and Susan Keogh, who say the pair rowed beyond expectations. "They certainly stunned the British and American crews in the semi-final," says Jim," and their time in the final was still superior to Britain who won the B final." He says the result was all the more surprising because the two only came together late this year at a three-week training camp, while they were also training with gold medal winner Sanita Puspure. "Last year she finished eighth in the world in a women's pair with Aileen Crowley at Sarasota Bradenton in Florida. Following two outings this year at World Cup regattas in Belgrade and Lucerne with two different partners, Aifric and Emily went to a three week long camp in Varese Italy which paid dividends for them at Plovdiv. "They are still a work in progress," says Jim, " but it is a wonderful achievement, and hopefully they will continue as a pair in the future." The women's pair is an Olympic Class boat and the World Championships Regatta at Linz Ottensheim in Austria next August will be the qualifying regatta for the Tokyo Olympics in 2020. The top 11 boats will qualify at this regatta with a further two boats to qualify at a final qualification regatta in 2020, and that is now their aim.